The love story of Shamiram and Ninous and the legend of Semiramis will come alive in Mesopotamian Night 2010 concert fund raiser. AAS-A Central Valley Chapter is commissioning the creation of an operetta based on a poetry piece by Rabi Yosip Bet Yosip. More updates will be posted later. Below is a translation of the poems by Dr. Arianne Ishaya. Grazing on the green hilltop was a flock of sheep. As I watched, I saw a maiden approaching clad in a lad’s attire. It was that of a shepherd’s. She blew her whistle, and all her sheep came together. Instead of water, she gave me milk from the sheep. From under her eyelids, she observed me; the pearls of her teeth, she hid behind her lips. Her long braids, she tossed over her shoulders. Before I could drink the milk from the earthen jar, weakness overtook my body, and my thoughts flew as if into a dreamland. The jar fell from my numbed hands. I begged her forgiveness for what had happened. The pearls of her teeth appeared from behind her lips and the jewel of her eyes hid under her eyelashes. The love of this mountain maiden enveloped my heart and led me to ask her, without much hope, who was the master of her splendid beauty. “My name is Ninos, the son of the high priest, Nahrin. From the city of Nineveh I have ascended to this mountain range. “Queen of beauty of these hills, what is your name?” I asked. “I am named after a dove. It is said that many years ago, a white dove had made a nest in one of the caves in the mountain. They say that the dove, with powerful wings, used to fly for hours in our blue sky. Like children that swim joyfully in waters blue and serene, she too used to swim and play in the blueness of our sky. It is also said that during one of the winter nights when the snow had covered the earth and the surrounding mountains, hiding the glorious peaks under its leveling white blanket, and when the clear, calm sky had closed its lid over the earth, suddenly the dwellers of these valleys heard the sound of a bird flapping its wings in that cold and clear night as it flew over their village. The villagers poured out of their dwellings in a hurry to find the reason behind the flapping of wings over their roofs. In their amazement they saw the white dove racing in alarm above the village roofs as though announcing the approach of an event. Shortly after, they heard the cry of a baby coming from the mountain hut of the village shepherd. They hastened towards the hut to help the mother; for they had remembered that she was expecting and the delivery date had arrived. She had no one to help her except for the village shepherd. They say one day, when I was a baby, people watched as the dove came down and perched on my cradle. She nested on my chest for many hours. During this last visit she left a small white feather on my chest, and then she flew high towards the distant horizon never to be seen again. I have kept that feather in the hope that when the time comes, this small white feather will lead me to my dove in the remote space above. That is why they decided to call me “Shamiram”, which means ‘A Name Exalted’. Yosip Bet Yosip was born in 1942 to Korush Bet Yosip and Anna Khoshaba Bet Yosip in the village of Zumalan, a suburb of Urmia, Iran. Early in his youth, Yosip learned about the Assyrian culture through listening to Assyrian folk songs, poetry, and story-telling conducted by the local elders. This is when his love for the Assyrian culture and heritage was originated. Yosip joined ‘Shooshata Umtanaia’ (The Society of Assyrian National Progress), a well-known Assyrian youth organization which helped to promote the Assyrian culture by honoring known Assyrian historical events such as the Assyrian New Year and Assyrian Mother's Day. Yosip assisted ‘Shooshata Umtanaia’ in assembling the first and largest library of Assyrian books ever collected in the modern Assyrian history. In 1960 Yosip joined the Nineveh Choir group conducted by maestro Nebu Issabey in Tehran, Iran where the group performed numerous concerts in Tehran and Abadan. His membership in ‘Shooshata Umtanaia’ and later his presidency of the same organization paved his way to a membership in the ‘Assyrian Youth Cultural Society’ (Sita Sapreta). In 1968, Yosip, a selected member of the ‘Shooshata Umtanaia’ was introduced to the political aspects of the Assyrian history and witnessed the birth of an international political organization to oversee the well being of his beloved Assyrian nation, the ‘Assyrian Universal Alliance (AUA)’. The Assyrian Universal Alliance (AUA) had requested of Assyrian composers the writing of an Assyrian National Anthem. 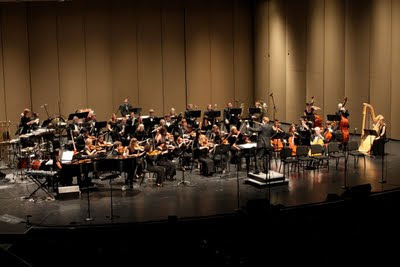 Maestro Issabey was one of many who had contributed to this project with one of his compositions that included the lyrics of Yosip Bet Yosip. This National Anthem was selected and ordained by the AUA, and the Assyrian American National Federation (AANF) and spread its use. Today, Yosip lives in Turlock, California, in the United States of America. AAS-A Central Valley Chapter is honored to work with Rabi Yosip our renowned Assyrian poet to bring alive the legend of Semiramis the Queen of Assyria as an Assyrian Operetta. AASA-LA Chapter has created a beautiful calendar for 2010. You can order your copy from us online on this website. Mother Teresa was once quoted as saying" If you can't feed 100 people, then feed just one". Can you find it in your heart to help just one person? 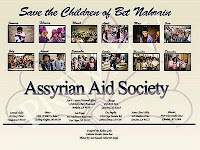 AAS has printed a beautiful calendar with the pictures of our children in Atra, for the year 2010. 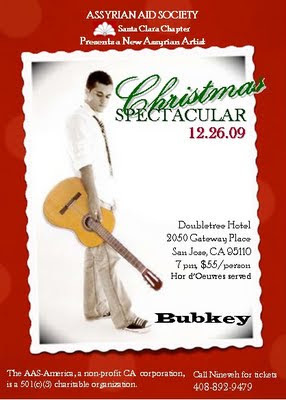 The price of a Calendar is only $10. Below are a few samples of the months of our calendar. 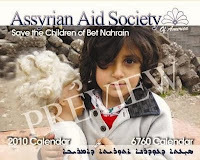 We would like to see this calendar and its message in the homes of every Assyrian/Chaldean/Syriac around the world. Our video crew at MJC film department has given us a slightly modified version of "Assyryt: The Assyrian Diamond" DVD. 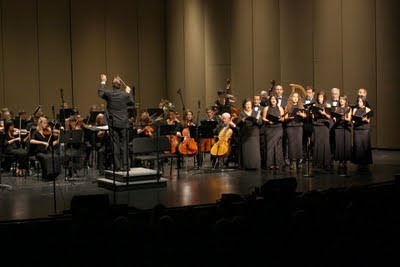 This trailer now includes a scene from the Mesopotamian Choir Ensemble". 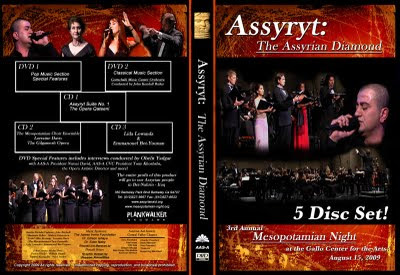 It is a pleasure to announce to the Assyrian community and all enthusiasts of Assyrian music and culture that the DVD/CD product from the Mesopotamian Night 2009 concert fundraiser is almost ready. In the meantime enjoy the following trailer for the DVD. The details will be announced later. 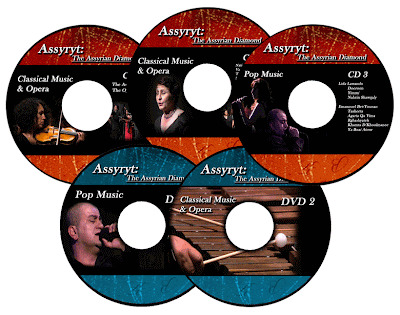 The DVD is named "Assyryt: The Assyrian Diamond" in honor of late Rabi Paulos Khofri and his beautiful music suite "Assyryt" which was composed in 1984 in Tehran.